This is the first novel I have read from John Grisham and it is one of his books which tackles a different genre and not his usual legal thriller. Having around 200 pages in medium format it is soft, entertaining and easy to read especially for a day when you have nothing to do. The title "Skipping Christmas" discloses that the novel has to be some kind of Christmas story. And indeed it is a funny one. Luther and Nora a middle-aged american couple decides that they do not want to celebrate this Christmas also because their daughter Blair have left for South America to teach the indigenous children of Peru. And of course Luther intends to avoid the usual Christmas time spendings: no party, no Christmas tree, no more any useless gifts, no more donations, no shopping, no more any needed house decorating. Luther as an accountant used to crunching numbers estimates that he will spare 6000 of dollars. First he plays with the thought of spending time on the sunny Carribean shores but in the end he chooses a Carribean cruise for the hollidays. His wife is not so entusiast about it but she gives in. The neighborhood does not undertand and does not accept the out of ordinary decision. They mock Luther and Nora labeling the couple stingy failing to comprehend how can somebody give up Christmas. This book is also a good example on what happens when someone gives up the herd mentality. I stop here with the depicting and if you are interested check out the novel. Skipping Christmas at Amazon. 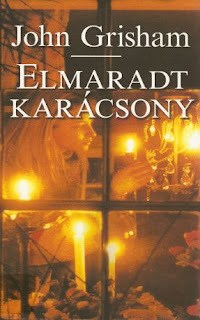 Because I have read the novel in Hungarian I included the cover of the Hungarian edition titled Elmaradt Karácsony. I still have to mention that in 2003 the book was made into a movie titled Christmas with the Kranks, you can watch online the whole movie at youtube. I have not seen the movie so I can't comment how good or bad it is.